Exhibits - The Telephone Museum is operated by The New England Museum of Telephony, Inc. The Telephone Museum is operated by The New England Museum of Telephony, Inc. MANY EXHIBITS ARE OF WORKING EQUIPMENT, functioning as it did years ago when communities in Maine, New England, and other parts of the country and the world were served by the wired telephone network. The museum is home to a sizable collection of switches, switchboards, telephones, tools, schematics, photographs and other items of telecommunications history. are represented by venerable, wooden Magneto boards of the type that were used in the late 19th and early 20th centuries. It was during this time that the Bell Telephone Company began to spread its “octopus” network of wires from Boston, Massachusetts into cities and towns throughout the northeast. 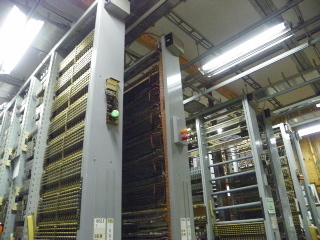 The improved Common Battery board is also represented, and both types are functioning well enough to make calls to phones (and to other switching systems) within the museum’s network. system was patented in 1891 by Almon B. Strowger, an undertaker, in Kansas City, Missouri. And therein lies a tale! Learn about Mr. Strowger and the introduction of dial telephones through working Strowger systems. It was the dial telephone system that would spur the growth of Independent Telephony and further spread the network westward, and to villages and towns overlooked by Bell. The Strowger system (known as Step-by-Step in Bell Telephone parlance) was the mainstay of telecommunications for more than 100 years. The Frenchboro Central Office on the grounds of The Telephone Museum in Ellsworth, Maine. is represented in the form of a CX-100 (capable of serving 100 subscribers) that is housed in the original building of The Island Telephone Company’s Frenchboro Central Office. This Independent was once the country’s smallest telephone company, located on an island off the coast of Maine, the building and equipment are intact and still functioning. The #5 Crossbar System from Belfast, Maine now up and working at The Telephone Museum in Ellsworth. introduced the most technically sophisticated electro-mechanical telephone switching equipment of the mid-20th century. Designed by Bell Telephone Laboratories, the #3 and (partial) #5 Crossbar systems on display are operational. Both served communities in Maine, and both were acquired through the generosity and cooperation of the former New England Telephone Company. The Ericsson AGF500 in Mollendo, Peru before being dismantled and shipped to Ellsworth, Maine. Photo courtesy of Matthew Strong. such as the entire Clinton C.O. 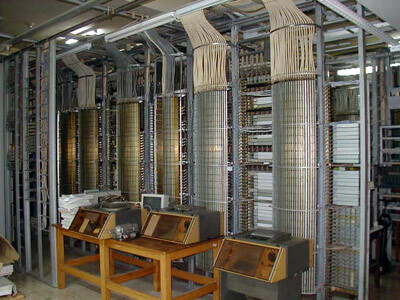 (the last Step-by-Step system in Maine), a (partial) panel system from Brownsville, Brooklyn, NY, an Ericsson AGF500 from Mollendo, Peru, and a number of XY switches such as those used by the Unity (Maine) Telephone Company, are all in storage – all large scale exhibits of the future. And many more exhibits drawn from the museum’s collections are possible. 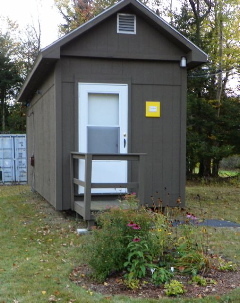 A building exclusively devoted to switchboards – an exhibit on Telstar and the receiving station once located in Andover, Maine – an outdoor exhibit on pole line construction, including a hiking trail on museum grounds. These, and more can be possible – with your support. Help bring these historic switches and other equipment back to life. Please click on SUPPORT to be a part of this exciting adventure. are all around you. In the main building, look up at the gallery where tools, telephone sets and other unusual items are displayed. In a display case items from individual collections are presented and exhibits change from time to time. With the opening of the new Visitor Center in 2014, temporary exhibits highlighting a particular theme may be set up. Stay tuned!